To the people who don’t know what to do with their money – I highly recommend this seminar. For people who knows what to do with the money that they still don’t have – this is a must! Randell is the next BIG thing in NO-Nonsense Personal Finance! We learned so much from your Randell’s seminar especially regarding other types of investment vehicle which he thoroughly explained and he clearly laid down other options that will help us in our long term financial goal. Excelsior Customs Brokerage/Excelsior Refreshment Co. Ltd. The seminar I attended was very informative, an eye opener especially to the yuppies who are pretty much starting their financial portfolios. It was done in a light, casual approach yet covered finances holistically and comprehensively. 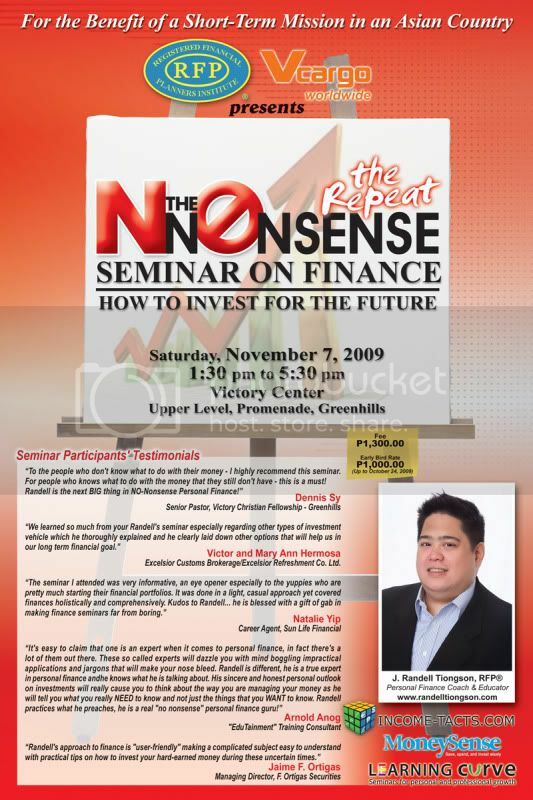 Kudos to Randell… he is blessed with a gift of gab in making finance seminars far from boring. It’s easy to claim that one is an expert when it comes to personal finance, in fact there’s a lot of them out there. These so called experts will dazzle you with mind boggling impractical applications and jargons that will make your nose bleed. Randell is different, he is a true expert in personal finance andhe knows what he is talking about. His sincere and honest personal outlook on investments will really cause you to think about the way you are managing your money as he will tell you what you really NEED to know and not just the things that you WANT to know. Randell practices what he preaches, he is a real “no nonsense” personal finance guru! Randell’s approach to finance is “user-friendly” making a complicated subject easy to understand with practical tips on how to invest your hard-earned money during these uncertain times. Catch the Repeat!!! November 7, 2009 (Saturday), Victory Center, Upper Level, Promenade, Greenhills; 1:30 to 5:30 p.m.
To register, send e-mail to [email protected] or sms to 0917-9023225.